1APP InstantScan provides customers the ability to scan images like QR codes that instantly open your app without any download or install, in context and in the real world. InstantScan bridges the offline to the online world for apps that your customers can use in locations that are relevant to them. Your customers can now access your app through a simple QR code that can be shared or displayed in your retail locations. For instance, whether she is standing in line at a coffee shop or waiting to buy a ticket at the movies, InstantScan provides the ability to instantly launch your app and fulfill a transaction in seconds. 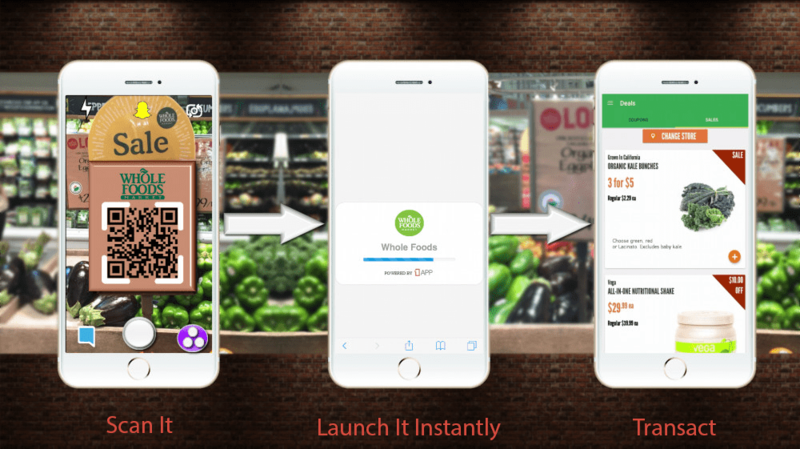 1APP InstantScan delivers your mobile app to your customers at the right time and right place as they’re shopping.